When Truckee Brewing Company Master Brewer Adam Lundy tasted his first batch of beer ahead of the brewery’s soft opening last May, he knew he’d nailed it. Owner Dustin Hurley and Lundy teamed up last year to form the brewing company with a goal of creating high quality beer. 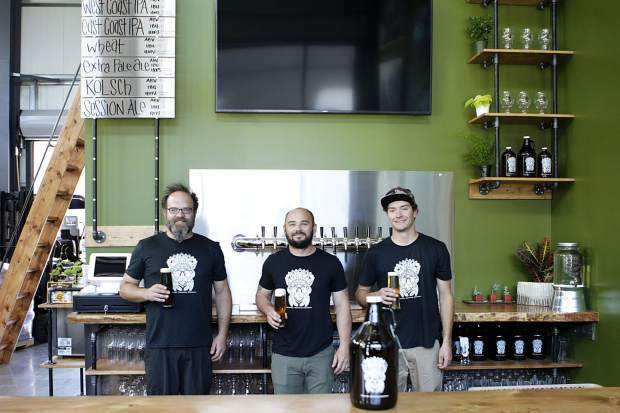 After months of work to procure licenses, a location in the Pioneer Commerce Center, and equipment, the two produced the brewery’s first beer — a 5.3 percent alcohol by volume session ale. Lundy, who’s been brewing both professionally and at home for nearly three decades, used four different hops to create the clean, smooth ale, which would later be joined by a handful of other beers on the brewery’s tap list. Hurley, a native of Maryland, moved to Truckee eight years ago after plans of attending culinary school in Napa didn’t materialize. Though school in Napa didn’t work out, he said he still decided to move to California, keying in on the Truckee-Tahoe area because of its ski resorts and restaurants. Later on, Hurley began researching ways of opening a restaurant of his own in Truckee, but came across a different business opportunity instead. “It seemed like there was a bit of a demand for a brewery that would be able to distribute to local restaurants around Tahoe and Truckee,” he said. Having no experience in brewing, Hurley needed to find the right person if he was going turn his vision of a new brewery in Truckee into reality. Hurley did, however, have a wealth of experience in the restaurant industry and knew that finding the right chef to run a kitchen was vital to the success of the business. Through Chef Mark Estee, Hurley was put in touch with Lundy, and the two found a connection in creating high-quality beer without cutting corners. “We had the same sort of vision of how we wanted the beers to come out,” Hurley said. Lundy hadn’t always planned on becoming a brewer. He graduated from the University of Nevada, Reno with a degree in geography and had aspirations of creating maps for a living. But after finding difficulty entering the field, he began down a radically different path. With only home brewing as his experience, Lundy said at first he wasn’t able to find work in any breweries around Reno. So he made his own in his backyard. Lundy would go on to work at Virginia City Brewery & Taphouse, Great Basin Brewing, High Sierra Brewing and then later as an assistant brewer at Buckbean Brewing Company. Stylistically, Lundy said he goes through phases in his preferences for both making and drinking beer. One thing that is consistent though is his desire to craft a well-balanced, clean beer. From the outset, Hurley’s focus has been driven by the quality of his company’s beer. The brewery sports a five-barrel brewing system that can churn out 240 kegs a month. The company also uses steam boilers to keep precise temperatures during the brewing process. Truckee Brewing Company puts a large emphasis on the quality of water used in making its beers as well. The brewery uses water from Truckee, but added a filter, which, according to Hurley, isn’t something a lot of breweries utilize. Truckee Brewing Company currently has seven beers on tap at the brewery. The company’s beer can also be found at Rubicon Pizza, Yamakai Fish & Sushi, Copperlane Cafe, Philosophy, Truckee Tavern and Grill, Old Town Tap and Trokay. The brewery also offers growlers to take beer home, and has specials throughout the week. For more information visit TruckeeBrewCo.com.